"Who wouldn't enjoy saying that our company sponsored Tyler's funeral?" The art of marketing in America has become something of a joke in the past several years. Everything that can have sponsorship does, and even the things that were once considered ridiculous locations for advertising are not safe anymore. So is it any surprise that a film satire dealing with the fascination the world has with profiteering would soon come to the shelves of your local video store? 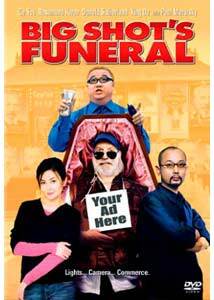 The film is Big Shot's Funeral, and the premise is rather brilliant though the execution is seriously lacking. When the most celebrated director in America, Don Tyler (Sutherland), decides to do a remake of The Last Emperor, he travels to China and begins what will be his last opus. When Tyler loses his vision for the film, the production runs ridiculously over budget, a studio executive (Mazursky) flies in to hand over the reigns to a young music video director. This sends Tyler even further into his spiral and he takes to his death bed. His last request is made to a documentary filmmaker (Ge You), whom he asks to give him a "comedy funeral," one that will have the visitors elated when they leave. Soon the planning is on and nothing is sacred, not even an empty space on the hearse, which is made available to the highest bidder. The macabre suggestion that the planning of a funeral is so expensive that money needs to be raised by advertisements placed in the funeral procession is rather funny in my opinion. Funeral has the premise of a twisted and delightful black comedy, but instead gets caught up in all of the messages it attempts to convey. Is it about marketing destroying the sanctity of such events? Or is it dealing with the newfound sense of capitalism that is sweeping mainland China? The biggest flaw is that the viewer does not find an answer to either of these questions. The satire here is admirable, but with no real emotional message the effect is lessened. The film is slickly directed by Xiaogang Feng, who also wrote the script, and the scenery and locations are at times marvelous; the Forbidden City gets its fair share of glowing moments. Perhaps this is the ultimate irony: here is a film poking fun at marketing and advertising, while the film itself shows a lot of gloss but no real substance. Like, say, a snazzy commercial for a rather dull and uneventful product...? Image Transfer Review: Presented in anamorphic 1.85:1 widescreen Big Shot's Funeral looks very nice. There are a few moments where grain is evident. Colors are vibrant when present, and black levels are above average in quality, which is a good thing considering the film is often shot in murky tones. Audio Transfer Review: The Dolby Digital 5.1 track is largely focused in the center channel, with dialogue sounding crisp and clear throughout. The left and right speakers do a fine job of creating ambient sounds while the surround speakers back up the upbeat score periodically. Extras Review: Trailers for Time and Tide, So Close, and of course Big Shot's Funeral are offered. Big Shot's Funeral may be worth a rental given its satiral bent and some strong performances, but ultimately it disappoints.